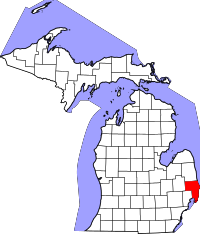 St. Clair County is a county in the U.S. state of Michigan. As of the 2000 census, the population was 164,235. According to the U.S. Census Bureau, it forms part of the Metro Detroit area, although residents of the area may disagree. The county seat is Port Huron6. The county was created 10 September 1820 and its government was organized in 1821. According to the U.S. Census Bureau, the county has a total area of 2,167 km² (837 sq mi). 1,876 km² (724 sq mi) of it is land and 291 km² (112 sq mi) of it (13.42%) is water. St. Clair County is one of five counties that form the peninsula that projects into Lake Huron known as the Thumb St. Clair County is very economicaly attached to its neighbors, Metropolitan Detroit,Sanilac County, and Lambton County located in Ontario. M-25 (this highway follows the Lake Huron/Saginaw Bay shorelie, Starting in Bay City and ending in Marysville, just south of Port Huron. As of the census² of 2000, there were 164,235 people, 62,072 households, and 44,629 families residing in the county. The population density was 88/km² (227/sq mi). There were 67,107 housing units at an average density of 36/km² (93/sq mi). The racial makeup of the county was 94.96% White, 2.10% Black or African American, 0.50% Native American, 0.40% Asian, 0.02% Pacific Islander, 0.64% from other races, and 1.38% from two or more races. 2.19% of the population were Hispanic or Latino of any race. 96.3% spoke only English at home, while 1.4% spoke Spanish. There were 62,072 households out of which 34.60% had children under the age of 18 living with them, 57.40% were married couples living together, 10.40% had a female householder with no husband present, and 28.10% were non-families. 23.40% of all households were made up of individuals and 9.60% had someone living alone who was 65 years of age or older. The average household size was 2.62 and the average family size was 3.09. In the county the population was spread out with 26.80% under the age of 18, 7.90% from 18 to 24, 30.00% from 25 to 44, 23.10% from 45 to 64, and 12.20% who were 65 years of age or older. The median age was 36 years. For every 100 females there were 97.10 males. For every 100 females age 18 and over, there were 94.50 males. The median income for a household in the county was $46,313, and the median income for a family was $54,450. Males had a median income of $42,572 versus $25,880 for females. The per capita income for the county was $21,582. About 5.80% of families and 7.80% of the population were below the poverty line, including 9.30% of those under age 18 and 8.30% of those age 65 or over. Jenks, William Lee. St. Clair County, Michigan, its history and its people. Chicago and New York: The Lewis publishing company, 1912. This page uses content from the English language Wikipedia. The original content was at St. Clair County, Michigan. The list of authors can be seen in the page history. As with this Familypedia wiki, the content of Wikipedia is available under the Creative Commons License.